Creates GraphViz files from Partitioner data. Step 2 (choosing vertices and edges) is accomplished via vertexOrganization and edgeOrganization methods and the Organization::select method invoked on their return values. Step 3 (setting labels and other attributes) is performed the same way, but with Organization::label and Organization::attributes methods. This class also has a number of "select" methods that perform steps 2 and 3 at the same time; these methods adjust labels and attributes only when selecting a previously unselected vertex, edge, or subgraph–otherwise they use the label and attributes that were previously specified. Step 4 is normally achieved by invoking the emit method, but the class also defines other emitters that combine a "select" method of the same name with emit. Definition at line 432 of file GraphViz.h. Property: color to use for background of function return nodes. Property: color to use for background of special nodes and for warnings. Attributes for a CFG vertex. Attributes for a CFG edge. Property: color to use for function subgraph background. Returns true if the edge spans two different functions. Constructs a GraphViz emitter that uses the control flow graph (and possibly other data structures) from the specified partitioner, or the provided control flow graph which must be compatible with the partitioner. The GraphViz object will hold a reference to the partitioner, therefore the partitioner should not be deleted before the GraphViz object. The partitioner that's being used, set when this emitter was constructed. Definition at line 467 of file GraphViz.h. When this property is true, GraphViz-emitting methods that adjust the vertex, edge, and/or subgraph organization will create new subgraphs for each function that has selected vertices. The subgraphs will correspond to functions. Vertices that don't appear in any function will likewise not belong to any subgraph. Definition at line 476 of file GraphViz.h. Definition at line 477 of file GraphViz.h. Property: show basic block instructions. 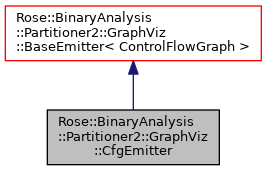 When true, vertex labels computed by the GraphViz-emitting methods (as opposed to labels set by the user), will contain the disassembled instructions. Otherwise such labels will consist of only the basic block starting address. This property is expected to be honored by the vertexLabel virtual method. Definition at line 487 of file GraphViz.h. Definition at line 488 of file GraphViz.h. When true and basic block instructions are shown (showInstructions), then the address of each instruction is also rendered. This property is expected to be honored by the vertexLabel virtual method. Definition at line 497 of file GraphViz.h. Definition at line 498 of file GraphViz.h. Property: show instruction stack deltas. When true and basic block instructions are shown (showInstructions), then each instruction will be preceeded by a two-digit (or more) hexadecimal stack offset. The stack delta appears after the address (if any). This property is expected to be honored by the vertexLabel virtual method. Definition at line 508 of file GraphViz.h. Definition at line 509 of file GraphViz.h. Those instructions that are part of a no-op sequence are rendered in a different font (such as strike-through). When two or more sequences overlap, the largest sequence is struck and all overlapping sequences are not processed. For nested squences, this causes all instructions to be struck; for overlapping but non-nested sequences, only the largest one is struck. Definition at line 520 of file GraphViz.h. Definition at line 521 of file GraphViz.h. Property: color to use for background of function entrance nodes. Edges to these nodes are created by converting the background color to a foreground color by inverting the value in HSV space (keeping the same hue and saturation). Definition at line 531 of file GraphViz.h. Definition at line 532 of file GraphViz.h. Property: show outgoing edges to neighbor vertices. If set, then a function selector will also select inter-function edges originating from the selected function, and the incident vertices for those edges. Most of the time the incident vertices will be entry points for called functions. Definition at line 555 of file GraphViz.h. Definition at line 556 of file GraphViz.h. Property: show incoming edges from neighbor vertices. If set, then a function selector will also select inter-function edges targeting the selected function, and the incident vertices for those edges. Under certain (usual) circumstances, all incident vertices from the same function are collapsed into a single function vertex and the parallel edges are replaced with a single edge having a label indicating the number of original edges and their types. Definition at line 567 of file GraphViz.h. Definition at line 568 of file GraphViz.h. Property: show function return edges. If this property is false, then selector functions that normally add E_FUNCTION_RETURN edges to the output will omit those edges instead by calling deselectReturnEdges. Definition at line 577 of file GraphViz.h. Definition at line 578 of file GraphViz.h. If an address to source mapping is provided then source location information will be shown in each vertex. Definition at line 586 of file GraphViz.h. Definition at line 587 of file GraphViz.h. Definition at line 588 of file GraphViz.h. Selects vertices in some interval. Selects all vertices whose starting address falls within the specified interval, then selects all edges that connect any two selected vertices (regardless of whether those vertices were just selected by this method or were previously selected). Select vertices and intra-function edges for one function. Select outgoing edges to neighboring vertices. These edges typically represent calls to other functions. Select incoming edges from neighboring vertices. These edges typically represent calls from other functions. When possible, multiple edges from the same function will be replaced with a single pseudo-edge coming from that function's entry vertex. Deselect all function return edges. Any edge of type E_FUNCTION_RETURN is deselected. Deselect a vertex if it has no selected incident edges. Deselect vertices of specified type if they have no selected incident edges. Selects vertices that are neighbors of selected vertices, and the edges that connect them. Selects graph elements for whole-graph output. (Re)selects all vertices and edges and gives them default names and attributes according to certain properties defined in this object. The user then has a chance to make adjustments to the organization before calling emitSelectedGraph. The emitWholeGraph does the selection and emitting in one step. Selects the CFG for one function. Selects all vertices and edges that are part of the specified function. Additionally, any inter-function edges to/from this function and their incident vertices are also selected according to selectFunctionCallees and selectFunctionCallers. Selects vertices that start within some interval. Selects all vertices whose starting address falls within the specified interval, plus all edges whose incident vertices are selected. Additionally, neighboring vertices and connective edges are optionally added depending on showOutNeighbors and showInNeighbors. Dump entire control flow graph. This is a convenient wrapper around selectWholeGraph and emit. Definition at line 665 of file GraphViz.h. Dump control flow graph for one function. This is a convenient wrapper around selectFunctionGraph and emit. Definition at line 672 of file GraphViz.h. Dump control flow graph for some address interval. This is a convenient wrapper around selectIntervalGraph and emit. Definition at line 679 of file GraphViz.h. First function that owns a vertex. Returns the first of possibly many functions that own a vertex. "First" is defined as the function listed first in the set returned by CfgVertex::owningFunctions. Returns null if there are no owning functions. Definition at line 704 of file GraphViz.h. Functions that own a vertex. Returns a set of pointers to the functions that own the specified vertex. Usually a vertex is owned by either zero or one function. Definition at line 716 of file GraphViz.h. Assign vertices and edges to subgraphs. Each vertex is assigned to a subgraph, one subgraph per function. If a vertex is owned by more than one function then the "first" function is used, where the definition of "first" is quite arbitrary. Returns a string indicating the source code location for a vertex. If no information is available then an empty string is returned. Returns the simple label for a CFG vertex. The simple label is usually just an address rather than instructions, etc. The returned lable must include the delimiting double quotes or angle brackets and have proper escaping of contents. Detailed label for CFG vertex. The detailed label can be a multi-line value and must include delimiting double quotes or angle brackets with proper escaping of the content. This method should honor the showInstructionAddresses and showInstructionStackDeltas properties. The returned lable must include the delimiting double quotes or angle brackets and have proper escaping of contents. The returned label must include the delimiting double quotes or angle brackets and have proper escaping of contents.